In what can only be described as a most unusual “disturbing of the peace” case, police were called to Short Pump Town Center to deal with a man and his puppet outside of Kay Jewelers. According to WTVR, the man was yelling profanities at shoppers ventriloquist style or as the correspondent put it “talking smack”. Apparently, the man left before the police arrived, so no official charges were brought against the man and his puppet. The entire incident begs a different societal question, however; how freedom of speech is extended to a man and his puppet and the role of ventriloquism in our daily lives. For those who are not aware, the art of ventriloquism or the more formal ventriloquy, is the ability to throw one’s voice so that it appears to be coming from elsewhere. The stagecraft, usually performed in tandem with a puppet, has its origins in an ancient Greek religious practice: The voices which were thrown were supposed to be a conduit by which people could speak with the dead. This was a common practice for people who were visiting the Oracle at Delphi. In more recent times, yet the practice became widespread in 18th Century England for traveling menageries and carnivals. 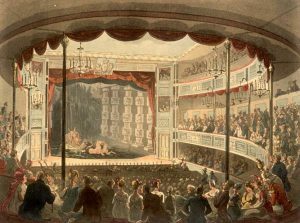 The usage of puppets for ventriloquy really took hold in the 19th Century when performer Fred Russell took to the stage at the Palace Theatre in London. Whether the pair was there with the intentions of speaking with the dead, performing in vaudevillian fashion or just officially creep out shoppers, this is probably not the last appearance of the mysterious ventriloquist and his dummy.